The Platinum Coast Amateur Radio Society (PCARS) is a radio club in Melbourne, FL. The club has over 250 members, but many of them are only with us during the winter. Over the years Don Winn - AF4Z, the club technical chairman has led many different club construction projects. This project started in early 1995 when several club members expressed an interest in a RTTY unit to work with the shareware Hamcomm software. Several members provided system requirements and design input, and the result was a full featured AF4Z Multi-Modem. The goal was to keep the price affordable to all club members, but build a quality unit equal to or better in performance than commercial TNC units. The unit also had to be fun to build and easy to assemble and tune, even for an inexperienced kit builder. Hence, a lot of thought and effort went into the design, component selection and PC board layout. To help with assembly and prevent solder problems, the PC board was silk screened showing part placement. The bottom has a solder mask to prevent solder bridges and to give the kit a more professional look. Don did the electrical design, schematic capture, PCB layout and parts list. One of the club members made a tooling jig to allow the chassis to be drilled. Several club members got together on a weekend and drilled and silk screened the units. On another weekend club members got together and packaged all the parts into kits. One of the members took a kit and wrote the assembly manual while he assembled his kit. Thirty-five kits were originally packaged for club members who signed up for the project. About fifteen club members participated in the various tasks required to make the project successful and as time went on it truly became a club project. The AF4Z Multi-Modem was designed to support all the features in Hamcomm. Hamcomm is a shareware package which was developed by DL5YEC. The multi-modem was primarily designed for 45 baud RTTY, however it can be used at much higher rates. It will operate in either FSK or AFSK mode. It supports up to 110 baud ASCII and CW reception and transmission. The unit also supports multiple Amtor modes. By using the built in comparator demodulator, the unit supports WEFAX and NAVTEX. With other software, such as JVFAX or SSTV, it can be used for SSTV transmit and receive. The computer interface can be wired for use with Hamcomm or with other software packages such as RTTY by WF1B. Many of the club members purchased both of these software packages. I have found that for general RTTY rag chewing , DX work or experimenting with the multiple modes I like using Hamcomm. But, for contest work I use the WF1B software. The PCB for the unit is 4" x 4.5" in size and has over 100 parts. It is housed in a Radio Shack enclosure which is 3" H x 5" W x 6" D. The enclosure is clean and simple. On the front is a four position rotary switch to turn on the unit and select the mode. There is also a power LED and an LED for Mark and Space tuning. The back panel contains two 1/8 inch phone jacks for separate audio input and output, 12V DC input, a five pin DIN for AFSK and PTT, and an RCA jack for the FSK/CW keying output. A cable with a serial port connector was provided for the computer interface. Of course there are always those of us who cannot leave anything alone. I have added scope and external tuning indicator outputs on the back of my unit. Several others have added a driver chip and DIP LED indicator on the front to allow easier tuning than the mark and space LEDs. Also, the Hamcomm program uses different RS232 pins than RTTY by WF1B so some of us are using cable adapters or have installed a switch to change the signals going to the computer. The unit is designed to allow easy modifications as new software programs become available. As a part of this project, in order to get club members some experience in operating RTTY, we organized multi-operator single transmitter efforts using my WA4VQD call for the August 1995 SARTG contest and the September 1995 CQ/DJ WW RTTY contest. In both these contests we had several operators who had never operated RTTY before, and only a couple of us had ever used the WF1B software. We stressed that the objective was to have fun and get some experience, but everyone really got into the competition. After those two contests we had twelve people who had good RTTY contest experience. As an added bonus we achieved a certificate for third place multi-single in the SARTG and third place multi-single USA in the CQ/DJ WW RTTY contest. Over twenty of the club members have completed the kits. There is nothing like a contest or DXpedition to really check out a piece of equipment. Several of us first used our own AF4Z multi-modems for a contest in the 1996 ARRL RTTY Roundup. I was extremely pleased with the performance of my unit and my second place SOH in the Southeastern Division. I used my multi-modem with a small oscilloscope for tuning. The unit had the ability to copy signals I could barely make out on the scope or hardly hear. Ever since that contest my commercial TNC has been sitting in the closet. Our club organized a multi-single high power contest effort using the multi-modem and Don's AF4Z call for the DJ WPX RTTY contest in March 1996. Again the unit performed very well and we received a plaque for our efforts. I tried to convince everyone it was just the unique AF4Z call, but Don insists it is the superior performance of the multi-modem. Experience helps, but it is not everything because once again we had a couple team members who had not operated RTTY. Of course I also attribute our success to my unique training method. I stand over the operator's shoulder with a ruler in my hand and hit his knuckles whenever he pushes the wrong key on the WF1B software. The July 1996 NAQP was the first time that some of our club members participated in a contest on their own. We had ten local club members in the contest. Eight of us used our AF4Z Multi-Modems and each of us was very satisfied with the performance. Some of us were more satisfied than others with the scores, even if we did not win any plaques. Our next months club meeting program will be "NAQP Murphy Tales" or "The reason I didn't do better in the NAQP was. . ." Oh, by the way, the "Pile Drivers" owe the "Florida Space Coast Team" dessert after the club meeting. 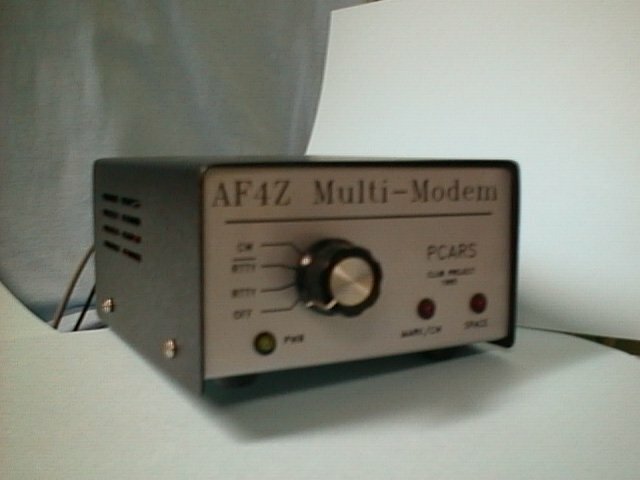 The AF4Z Multi-Modem turned out to be everything that we wanted in a club project. It helped introduce a number of hams to RTTY operating and contesting. It also helped them understand how RTTY works and improve their technical skills. This article will be followed by a more technical article on the AF4Z Multi-Modem. It will contain a block diagram, technical overview, and description of how the unit works. For a more indepth description of the circuit design and a block diagram.